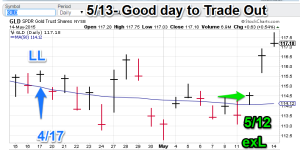 Gold: Gold moved significantly higher on 5/13, the first trading day after the CTM website issued it’s exit long signal. This was a pretty good day to exit. GLD is now up against resistance levels set in early April. Also GLD sold off the highs at the end of the day. With the yellow metal overbought, the best move is to wait for further indications of direction and a nonlinear trading analysis inspired enty. The model Gold portfolio remains flat. S&P 500: I am refitting the S&P models with the (2.0) revision, I expect to have this chart back online sometime next week. There will be another 30-day trial. If all goes well, my next project (you may want to sit down before reading further) will be largecap volatility ($VIX). I have been doing volatility related work recently. Can nonlinear trading analysis provide insight into future VIX spikes? We will be finding out. Bond Trading Signals. I am offering a similar Mummy process for Treasuries. See the “Bond Trading Signals” tab for more info. Currently available. Gold: The yellow metal tested the 113 (GLD basis) support level several times over the last 15-days and rallied to modestly higher levels. (Putin is going to meet with Kerry, I hope the Earth does not explode when those egos are in the in the same place). However, nonlinear trading analysis has signaled to move us to neutral with today’s data. This is the first signal from the major revision (2.0). I suspect we will be getting more frequent signals going forward but we will have to see. Model Gold portfolio is now flat. S&P 500: I am refitting the S&P models with the (2.0) revision, I expect to have this chart back online sometime next week. There will be another 30-day trial. If all goes well, my next project (you may want to sit down before reading further) will be largecap volatility ($VIX). I have been doing volatility related work recently. Can nonlinear trading analysis provide insight into future volatility spikes? I will be finding out. Currency Trading Signals. I am now offering a similar Mummy process for currencies. This service will involve two signal paths, one on the US dollar and the other on a user selected second currency (1+1).The fee will be the same as the bond trading signals. Currently available.